[Balloons breaking borders] seems to be more prevalent in hand lettering. I suspect this is because doing it digitally generally adds an extra few steps that can take time to do properly and cleanly. In Inkscape, a lot of things are being done manually already when it comes to making a comic, so a few extra steps here and there isn’t that big of an issue. For balloons breaking borders, it’s actually not too bad. Essentially, “Difference” is your friend. Anyone not familiar with the “Path” menu items for adding and subtracting between objects should play around with them, and get to know them. It’ll help develop ways of doing things, such as with a balloon breaking the panel’s border. For this tutorial, I’ve assembled all my players. I’ve already made a text balloon. 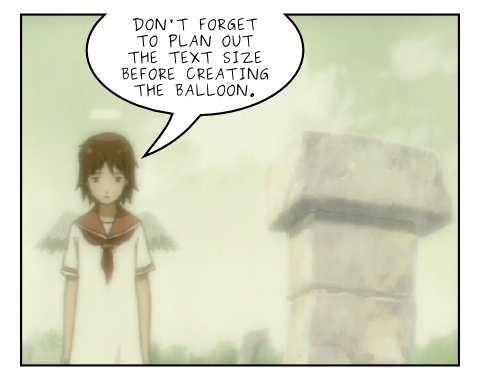 Ideally, I would have the panel’s image already in it, and the balloon would be sized for the text it will hold, but I wanted to stick with flat colors for this tutorial. There are two objects here. The green panel with the black border is where the image will be placed. 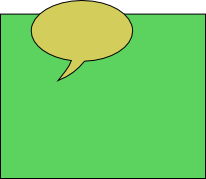 The yellow speech balloon will hold dialogue. At this point, the green panel could have its image visible, but it must not be clipped to the panel. I recommend placing the green panel over the image, then setting the panel’s fill to none or lower the alpha value so you can see through it while positioning the speech balloon. Here comes the magic. Select the yellow speech balloon and the green panel, then from the “Path” menu, select “Difference”. 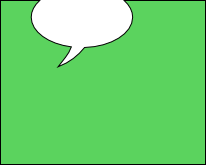 This will remove the shape of the speech balloon from the panel, leaving an opening where you can see the color of the page behind it. This technique leaves no border between the balloon and outside of the panel. If you want a border to be there, use “Division” instead of “Difference” from the “Path” menu. This will punch the shape of the speech balloon out from the green panel, but it will retain the full border of the panel. There’s a reason why “Difference” and “Division” work the ways they do, but that is beyond the scope of this tutorial. It’s that simple. Clip an image into the border, and position the text, and you’re good to go.